I am beginning to think Moon was a fluke? Source Code was a boring mess and Warcraft, while dedicated to its source material, couldn't inspire anyone other than the die hard fans. So despite the glorious debut of writer/director Duncan Jones that was Moon, perhaps Jones doesn't have it in him to make another glorious film. Mute, despite being a "spiritual sequel" to Moon, isn't that impressive follow up. 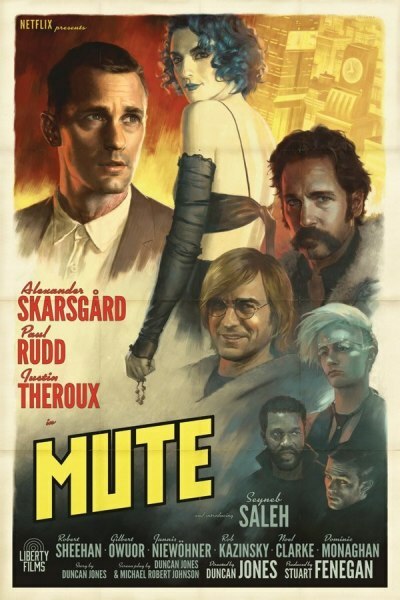 But although there are many failures in his second four-letter-M-word film, Mute has moments of brilliance which show perhaps another great film is coming from Jones, one day. Mute is sci-fi detective noir (a la Blade Runner) but it sinks into many of the pitfalls of the genre istead of rising above them. Jones' script is rife with toxic masculinity in a way which is celebrated not critiqued. The plot is classic pulp fiction, a man searching for a missing woman, a woman who was involved in a "shady" underworld where kink is equated with bad and purity is represented by the strong silent (white) man. These ideas are ripe to be played with and deconstructed but Mute has no time for that. Instead it revels in the cliches of that. One has to ask what are we seeing that's new here. I'm not sure the answer isn't "nothing." And there is a lot of "nothing" in this film. There are large parts of it which do not seem to advance the story of characterization much at all. Especially the film's connections to Moon which seem to be there only as a fan service. They are more than an Easter Egg, which could be a fun throw away, but less than integral to the plot. So again, what's the point? But there are interesting ideas here. I love the central conceit of the silent main character. The idea of being outside due to blocks in communication. That would be perfectly placed in this genre but the film never gets to truly unlock that idea.There is also the setting of Berlin, a city presented as a way-station for those lost, looking for... what? Again this feels like a missed opportunity. Jones' eye is good and his Berlin is a fascinating canvass. When he gets his hands on another good story I think he'll be able to do amazing things with it. But Mute isn't that great story. It ends up being little more than a "woman in a refrigerator" tale and it's honestly just not that interesting. The disturbingly shocking ending feels horrifically exploitative, not cleverly upsetting. I'll hold out hope but my good will from Moon is almost spent.